Today's classroom and training environments demand flexibility and timely access to power sources and data connectivity. With convenient, quick links to electrical outlets, data ports, and USB charging connections your students and business associates will be connected and energized for whatever challenges the day may bring them. With our Advanced Connection Technology (ACT) you can modify your existing tables to get fully-featured training tables for the classroom, meeting room, conference center, or the break room. 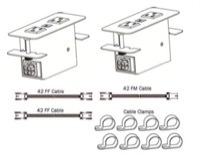 The ACT-Quik and ACT-CoVE kits listed below provide daisy-chain, table top connectivity to electric power outlets and USB charging connections. If you need connectivity to HDMI and VGA video displays, audio systems, and data networks we can customize a solution for you. The USB charging connections allow fast charging capabilities via 2.1 AMP service for your iPhone, iPad, and other mobile devices like Android phones and tablets. Sleek outside, smart inside, TransAction is a system that does it all. It offers basic benching for teams on the go, personalized workstations that provide privacy and focus, extreme technology options for applications such as trading floors and even upscale multi-media conference rooms. An easy to specify and assemble starter/adder system for single- or dual-sided workstations makes TransAction an ideal solution for the office environment that needs to maximize space and be flexible enough for a variety of users. TransAction has real style, flexibility and a price point that will appeal to any business. Upgrade your training and classroom tables with Advanced Collaboration Technology. The ACT CoVe (Quick Interconnect Kit) allows you to easily bring electric power and USB Charging Connections to your existing education tables. Upgrade your training and classroom tables with Advanced Collaboration Technology. The ACT CoVe (Quick Interconnect Kit) allows you to easily bring electric power and USB Charging Connections to your existing education tables. Upgrade your training and classroom tables with Advanced Collaboration Technology. The ACT CoVe (Quick Interconnect Kit) allows you to easily bring electric power and USB Charging Connections to your existing education tables. Upgrade your training and classroom tables with Advanced Collaboration Technology. The ACT CoVe (Quick Interconnect Kit) allows you to easily bring electric power and USB Charging Connections to your existing education tables. Upgrade your training and classroom tables with Advanced Collaboration Technology. The ACT QuIK (Quick Interconnect Kit) allows you to easily bring electric power, data, USB Charging, audio, and video connections to your existing education tables. Upgrade your training and classroom tables with Advanced Collaboration Technology. The ACT QuIK (Quick Interconnect Kit) allows you to easily bring electric power, data, USB Charging, audio, and video connections to your existing education tables. Upgrade your training and classroom tables with Advanced Collaboration Technology. The ACT QuIK (Quick Interconnect Kit) allows you to easily bring electric power, data, USB Charging, audio, and video connections to your existing education tables. Upgrade your training and classroom tables with Advanced Collaboration Technology. The ACT QuIK (Quick Interconnect Kit) allows you to easily bring electric power, data, USB Charging, audio, and video connections to your existing education tables. Sleek outside, smart inside, TransAction is a system that does it all. It offers basic benching for teams on the go, personalized workstations that provide privacy and focus, extreme technology options for applications such as trading floors and even upscale multi-media conference rooms. An easy to specify and assemble starter/adder system for single- or dual-sided workstations makes TransAction an ideal solution for the office environment that needs to maximize space and be flexible enough for a variety of users. TransAction has real style, flexibility and a price point that will appeal to any business. Sleek outside, smart inside, TransAction is a system that does it all. It offers basic benching for teams on the go, personalized workstations that provide privacy and focus, extreme technology options for applications such as trading floors and even upscale multi-media conference rooms. An easy to specify and assemble starter/adder system for single- or dual-sided workstations makes TransAction an ideal solution for the office environment that needs to maximize space and be flexible enough for a variety of users. TransAction has real style, flexibility and a price point that will appeal to any business. Sleek outside, smart inside, TransAction is a system that does it all. It offers basic benching for teams on the go, personalized workstations that provide privacy and focus, extreme technology options for applications such as trading floors and even upscale multi-media conference rooms. An easy to specify and assemble starter/adder system for single- or dual-sided workstations makes TransAction an ideal solution for the office environment that needs to maximize space and be flexible enough for a variety of users. TransAction has real style, flexibility and a price point that will appeal to any business. Sleek outside, smart inside, TransAction is a system that does it all. It offers basic benching for teams on the go, personalized workstations that provide privacy and focus, extreme technology options for applications such as trading floors and even upscale multi-media conference rooms. An easy to specify and assemble starter/adder system for single- or dual-sided workstations makes TransAction an ideal solution for the office environment that needs to maximize space and be flexible enough for a variety of users. TransAction has real style, flexibility and a price point that will appeal to any business. This Plug-N-Ppwer modular electric power component allows you to easily interconnect tables in conference meeting rooms, training centers and classroom environments. This Plug-N-Ppwer modular electric power component allows you to easily interconnect tables in conference meeting rooms, training centers and classroom environments. Plug-N-Play electric power cables and outlets to Interconnect conference, meeting, training and classroom tables. Our ACT-QuIK and ACT-CoVe kits enable you to daisy chain electric power, data, audio, USB charging, and video connections across the table tops in your conference room, training center, or classroom facility. These power modules easily interconnect and link together to allow you to easily reconfigure meeting tables, and training tables. If these ACT-QuIK and ACT-CoVe kits do not meet your requirements, call our office design specialists. We can help you customize one for your particular needs.